Can Adults Get Strep Throat From Children? Strep throat is most common in children between the ages of 5 and 15, but anyone can develop a strep infection, and it's becoming increasingly common in adults. Strep throat is highly contagious and adults can get the illness from an infected child. If you think you might have strep throat, consult with your doctor so your throat can be swabbed and a strep test performed. The symptoms of strep throat can range from mild to severe. The most common symptom is difficulty swallowing due to a sore throat. A fever also is present in combination with chills, nausea and overall feelings of malaise. Vomiting more commonly occurs with young children than adults. The throat is red and will sometimes have white patches located on the soft or hard palates of the back of the mouth. The lymph nodes of your neck feel swollen and are tender to touch. 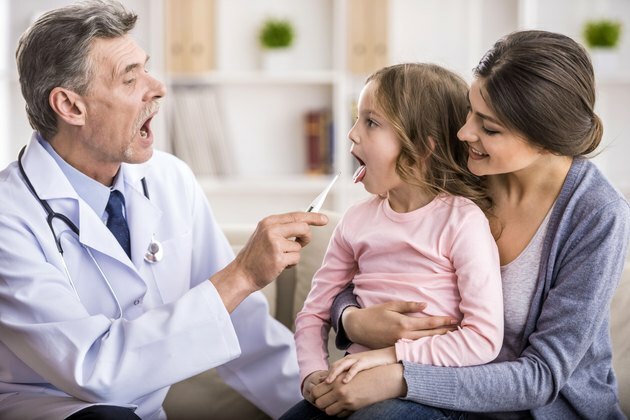 If your child recently had these symptoms and was diagnosed with strep throat, there is a good possibility you caught the infection from your child. Strep throat is caused by group A streptococcus bacteria. The bacteria can be easily transferred from person-to-person by airborne droplets of the nose and mouth. If your child coughs, sneezes, laughs or even talks, the bacteria can enter the air that you breathe and you can become infected. Average rate of transmission of untreated strep throat is approximately 35 percent among close family members. If you share eating utensils with your infected child or kiss your infected child on the mouth, your risk of strep throat increases. Some people can carry the streptococcus bacteria in the back of their throat without having any symptoms, but can still spread the bacteria to others. A 10-day course of antibiotics is a common treatment for strep throat. Children and adults are not contagious after taking antibiotics for 24 to 48 hours. To lessen the severity of a sore throat, gargle warm salt water several times per day and drink warm liquids. Throat lozenges help soothe an irritated throat from streptococcus bacteria. Acetaminophen or ibuprofen reduces your fever and relieves pain from a sore throat and swollen lymph nodes. Drink plenty of water to keep the throat lubricated and keep a humidifier in the room. If your child has strep throat, you can protect yourself by washing your hands frequently and thoroughly. Enforce strict hand-washing policies among other household members as well, because streptococcus is commonly spread among household members. Encourage your child to cover his mouth if he coughs or sneezes. Disinfect frequently touched surfaces with diluted beach to kill the streptococcus virus. Keep your family's toothbrushes separate from the child infected with strep throat and buy new toothbrushes once the child is no longer contagious.